It's time for a new "The Top Trend" post! 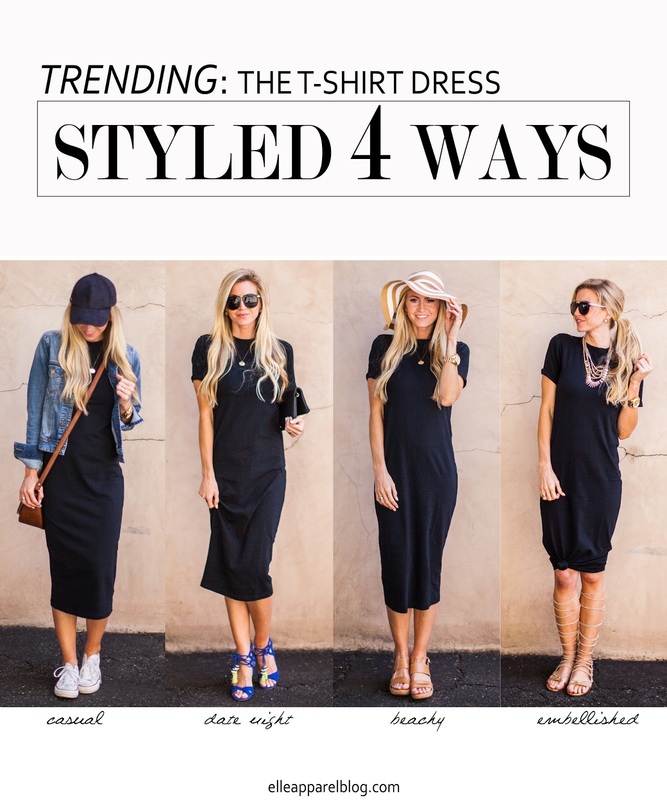 This month I wanted to take a simple T-shirt dress and show you 4 ways to style it. When it really comes down to it, the simple basic items in my closet are what get the most wear. A t-shirt dress lends itself to be casual. It's simple, comfy, and the fabric moves and breaths easily. It's a great alternative to jeans when you are running errands, especially on a hot day. And I love it paired with this suede baseball cap! With a solid color t-shirt dress, I love adding a fun colorful heel. I love the royal blue on this pair (I wore them out to a girls night this week and walked a block in them no problem! They are super comfy). I kept the clutch the same color as the dress to let the shoes do most of the talking in this look. A t-shirt dress is also a great option as a coverup to the beach. I added some pattern to this look with a big floppy striped hat, and threw on some comfy neutral wedges. The t-shirt dress is kind of like a blank slate, so you can pair lots of fun statement pieces with it. I've had my eye out for a good pair of gladiator sandals for this summer, and I love these ones! Since the neck on this dress is so high, I love the look of a statement necklace with it. The necklace is bold, and the shoes are bold, but they are far enough away from each other in this look that I don't think it's too busy. This dress was easy to wear, easy to style...and easy to order! I am completely obsessed with Zappos's one day shipping. I've been ordering directly from the Zappos app on my phone and it's quite addicting.